What Marie Forleo has to say may come as a shock. As a kid in the 80s, Forleo–a life coach, motivational speaker, author and web TV host–would watch her mother figure out how to fix the leaking roof and re-tile the bathroom. And this was all before the Internet. Wait—solving problems before the Internet existed? Before YouTube tutorials and WikiHow? How was that even possible? “When people tell themselves, ‘Oh I can’t have a mortgage, or I can’t have this’, well, wait. All of this is honestly figureoutable. It really, truly is. You just have to be willing to use your creativity and to think outside the box,” Forleo says. So let’s take a closer look at the way people lived and figured stuff out in the pre-Google era. First step? Put yourself in their shoes and disconnect. When was the last time you unplugged from the matrix, turned off your computer and your phone? Give it a try now–after you finish reading this article, of course. Once you’ve made peace with switching off your router, sit down in a comfy place with an inspiring beverage of your choice, and make a list of what ails you (just work-wise for now). What are the issues and challenges that are bothering you? What visions do you hold of your creative pursuits, what ideas or skills would like to explore but don’t know how? Instead of typing your question into the almighty search bar (and realizing you’re not the only one who’s asked this before), ask the original computer—your brain. But when it comes to wondering about the direction of your creative career, looking it up ‘real quick’ may not get you very far. There are plenty of ways to do some offline thinking—and that is probably the first step to thinking outside the box (hmmm, does ‘box’ refer to your router?). That’s when you’ll begin to realize that indeed, “everything is figureoutable” if you give it some good old-fashioned time. Go for a walk, a run, a drive. Do some intensive cooking. Many creatives turn to a field different than their own for inspiration. If you’re a photographer, attend a chamber music concert. If you’re a crafter, go see a play. If you’re a DJ, pick up a camera and see what happens. Whatever you need to shake your thoughts up. Another important step in figuring everything out is refusing to take NO as an answer from yourself. Maybe in the middle of an offline brainstorming session, you alight upon a crazy solution to a current work challenge—but the practical, conventional part of your brain freaks out and protests. But once you let yourself be pushed out of your comfort zone and slide into unknown territory (take a risk), that’s what will bring you to a new level of creativity and help you overcome your challenges. Thinking outside of the box essentially just means that you’re harnessing your creative powers while also keeping an open mind. 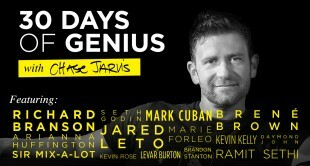 Thinking outside of the box means harnessing your creative power and keeping an open mind. Use your wide range of life experiences, talents and skills to coax out a new perspective, a new solution–even if it’s a partial solution. Eventually, that partial solution will lead to the rest, because you’ll know you are already on the right path, and the confidence in this knowledge is very powerful. Success in any creative industry requires this sort of boundary-pushing mindset. When you don’t find any ready-made answers that you can instantly apply, you will have to go your own way and make up your own rules. Forget what everyone else is doing or saying—thinking outside the box isn’t a team sport. It’s what makes you stand out. Saying that everything is possible doesn’t make you unrealistically optimistic. The answers are within you and within reach. You’ve just got to cut out the white noise and hone your instinct–through consistent practice–for making those bold moves that will lead you in the direction of success. 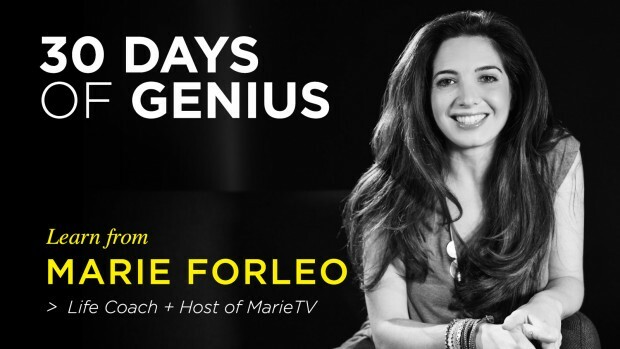 For much more with Marie Forleo on how to navigate the world of business, watch her hour-long interview in 30 Days of Genius right here on CreativeLive. Suchi Rudra is a nomadic writer of articles, stories and songs, taking inspiration from her travels. Follow her wanderings at Tread Lightly, Travel Naturally.